The new edition of "You Can Conquer Cancer' has just been released into the bookshops, and can be ordered on-line from the Foundation. Completely rewritten, this new edition presents all I believe in and have learnt from research and clinical experience gathered over the last 30 years. I rewrote the book as if I was speaking to a close member of my family who had developed cancer and needed hope and inspiration, along with the knowledge of what they could do to help themselves. Also, there are significant sections for family members and friends who are intent on supporting someone they love who has cancer, and would like to prevent cancer in themselves and others. I imagine it being of real practical use for health professionals. The new edition of "You Can Conquer Cancer' with the subtitle "- A New Way of Living", begins by examining the range of very real challenges that cancer presents, and the choices available for overcoming or even transforming these challenges. Both the medical and non-medical treatment options are examined and then it is made clear that what is on offer here is best described as Lifestyle Medicine. What I continue to be passionate about, and what this new edition of "You Can Conquer Cancer' details is how people can use their lifestyle therapeutically. This is not "Alternative Medicine", not even "Complementary Medicine” as such; it is what people can do to help themselves, Lifestyle Medicine. This is a comprehensive and empowering approach that integrates therapeutic nutrition, regular exercise, adequate sun exposure, healthy emotions, utilising the vast potential of the mind, meditation and imagery, and even the subtler but equally profound qualities of the spirit. The book highlights the difference between "positive thinking" and "wishful thinking", shares stories of remarkable survivors of cancer along with an extensive chapter on the theme of a "good death". The chapters on nutrition explain the relative merits of foods for healing, as well as highlighting how all members of the family will benefit from eating well - for the prevention of cancer and other illness, as well as for feeling well and being well. The original "You Can Conquer Cancer' was published in 1984 and it has been in print ever since. Translated into 13 languages it has sold over 250,000 copies world-wide. I am very pleased to have this new edition in print and thank my publisher, Michelle Anderson for so enthusiastically and professionally supporting the re-write. I expect those who have read and are using the old edition of "You Can Conquer Cancer' will benefit significantly from this new book, and my hope is that it helps many more people who will be new to it, to live long, meaningful and happy lives. Please note: You Can Conquer Cancer will be available as an E-book in about 2 weeks time. What to do when someone you love has cancer: Based on 30 years experience and feedback, Ian details how friends and family can best support and care for someone who has cancer. 1. Thanks to all the people who have responded to the recent articles in the Age. i) This last Saturday, the reporter Chris Johnston who has written of co-authored most of the articles, wrote another piece referring to the letter from my chest physician that I featured in last week's blog. He told me the piece from the week before had been heavily edited after he submitted it making it very unbalanced. He apologised and followed up with this latest offering which finally is beginning to make the truth more transparent. Amazingly, the Drs Haines and Lowenthal have refused to comment on the letter or its 6 new pieces of evidence, saying that it is up to me "to set the record straight". That seems really weird to me; I thought they were the ones who started the controversy around my diagnosis and that their claims that have not stood up to scrutiny. It seems some people find it hard to admit when the were wrong. I would like to say how much I have valued the support and learning that I have received through the Foundation over the past 2 years. It is not quackery, it is not a cult - it is about empowerment, it is about learning to take responsibility for yourself through making your own informed choices. We always have more choices than we think and I am very capable of making my own decisions rather than having them forced on me. I can choose the path that leads me to a definite early demise as indicated by my surgeon (who is a wonderful man too) as though I have been pointed at with the bone or I can choose a path where I make the decisions about managing this disease - a path that includes hope, controlling the factors that I can, making informed treatment decisions based on extensive research of all of my options. It is a path that addresses not just the physical elements of this disease but the emotional, the mental and even the spiritual. We are all going to die. I get to live my life informed by this and will do anything I can to live well to be an example to my children about living fully and with hope that maybe I will be a 1% er. Of course we all hope that our actions will halt the disease and lead to our physical wellness - who wouldn't? I the meantime, I live a great life because of how I live it and anyone in the medical profession who feels that this is wrong because it is not "evidence based" is sadly, I believe in the wrong profession. Fortunately I have a great team of both traditional and complementary therapists and Drs who support me every step of the way - we all want me to be a 1%er." The retreat will include direct teachings by Sogyal Rinpoche, presentations by senior instructors, study sessions, group practice and personal reflection. Sogyal Rinpoche is a world-renowned Buddhist teacher from Tibet and the author of the highly acclaimed The Tibetan Book of Living and Dying. He has a unique style of teaching, which enables him to translate the teachings of Tibetan Buddhism and make them relevant to modern men and women of all faiths. The retreat is open to students at all levels of experience, making the Myall Lakes retreat suitable for those completely new to meditation, as well as long term practitioners. PLEASE NOTE : This post was updated 22 April 2014 when a further key piece of evidence came to light - taking the original number of pieces of evidence quoted in the piece from 10 to 11. The new piece is number 11 below. This then is a call to action. The Age newspaper has revealed that the Gawler Foundation has suffered a major drop-off in attendances at its cancer programs this last few months. Linking the downturn to the financial crisis, there is the imputation that it has also been related to the hypothesis raised by doctors Haines and Lowenthal that I did not have secondary cancer, but only TB and their suggestion that my “famous recovery” was not from cancer. This extraordinary claim was made despite the doctors not consulting my original treating doctors or my original records which were extensive and conclusively prove the fact that I did have the secondary cancer. In this latest article, Chris Johnston of the Age chose to ignore six compelling new pieces of evidence that have come to light confirming that I was diagnosed with secondary cancer followed by the complication of tuberculosis (TB). This new evidence came out of a rigorous review of my case by Dr Jonathan A. Streeton, a recognized senior authority on TB and my Chest Physician for over 30 years. The new evidence, collated in a letter from Dr Streeton, includes clinical references, histology, pathology and photography. This adds to the existing evidence and brings to ten the individual points that confirm the original diagnosis. Unfortunately, Dr Streeton has chosen to neither speak to the media or to publish his conclusions in the journal where the original hypothesis was published – the Internal Medicine Journal. He tells me this is because he does not want to discuss a patient's details in public or become involved in a public controversy. Disappointing! However, he has given permission for me to use the letter, so I summarize the findings below and am happy to share it with anyone who requests it - you can do this via info@insighthealth.com.au. This new evidence adds to the details confirming the basis of the secondary cancer already published in the IMJ, and was published in letters to the IMJ by Ruth and myself - see the related blog below. In the light of this new evidence, I call on Haines and Lowenthal to publically concede their hypothesis was incorrect. There is a need to put the record straight. If they are interested in the truth of this matter, they need to respond. Why is this new evidence so significant? Well, thirty six years after I was originally diagnosed with secondary osteo-genic sarcoma (bone cancer) in 1975, the oncologists Haines and Lowenthal published an hypothesis that I may have been misdiagnosed. They speculated that my symptoms may have been explained by TB alone, and that maybe I never had secondary cancer. They then implied my “famous recovery” was in question and somehow this was extended to question the validity of the lifestyle-based self-help cancer programs I have conducted for over 30 years. This suggestion concerns me deeply as whatever the intention of Haines and Lowenthal, the effect has been confusing and damaging. The controversy surrounding their hypothesis and the resulting publicity may result in some needy cancer patients and their families being led away from valid lifestyle- based, self-help and support options being offered by many good practitioners and organisations. 1. X Rays of the spine were specifically diagnostic for cancer, not TB. An X Ray from my spine from 16/1/1978 shows marked destruction of the body of the 4th lumbar vertebrae with the intervertebral spaces well preserved. This finding is almost unheard of for TB. In Streeton’s words, this “would tend to be a specific excluder of a tuberculous process involving the lumbar vertebrae… as tuberculous infection would normally involve the intervertebral discs in the first instance”. Streeton points out that TB in the lumbar vertebrae normally evolves into what is called a psoas abscess that commonly leads to an open discharge via the groin. Despite large masses being involved in my case, there was no such abscess and no discharge. 3. The strain of TB that I contracted indicates I almost certainly contracted TB well after the secondary cancer diagnosis. Streeton was able to obtain my medical records from the South Australian Government’s Adelaide chest clinic where I was treated for TB in 1978. These records confirm the strain of TB that I contracted was resistant to the TB drug, Isoniazid. Such drug resistance was uncommon in Australia at that time, almost unheard of; whereas drug resistance was the usual in the Philippines and other parts of Asia at that time. I had never been outside Australia prior to developing secondary cancer late in 1975, but did travel to the Philippines in March of 1976 and again after chemotherapy later that year. I have always believed it most likely that I contracted the TB in the Philippines, probably on the second visit. 4. Key photographs have dates printed on them and further prove a response occurred with chemotherapy. This makes sense for cancer, but not TB. While the photographic evidence in my case is crucial, it has been debated. Here is why. In October 1976 I underwent chemotherapy for my cancer for 10 weeks. If I had had just TB not cancer, there is no rationale to explain how the visible masses on my chest could diminish in size. If I had had cancer, it would make sense. Perhaps because of my veterinary training, I am a keen documenter. So I had my chest photographed before commencing chemotherapy and took serial photographs each month until the lesions had disappeared in April 1978. Being fairly spectacular, those initial photographs, along with the “all clear” photos, have been reproduced widely in the medical and popular press. Unfortunately, early on the initial photos were miss-labeled as being from October 1977 – well after I had chemotherapy. Without checking with me, Haines and Lowenthal used the incorrect date to assert that the chemotherapy had not impacted on the course of my disease and claimed this indicated it was TB not cancer. However, as well as having the original photo album with the full sequence of photos and their dates recorded, only recently I discovered the photos actually have Kodak dates printed on their reverse. These dates confirm the correct timelines and show there was some reduction in size of the cancer in response to the chemotherapy. This response had also been confirmed in two letters I retained from the oncologist involved at the time, Dr Ivon Burns. On 13 August 1976 Burns writes, ‘the masses on the anterior aspect of the chest wall have increased in size’ and on 2 September 1976, ‘it measures 14 cm in diameter’. Then on 16 December 1976, he states that ‘the mass on his chest wall has decreased in size from 13cm ¥ 13cm to 10cm ¥ 10 cm’. 5. Histology of bone spicules coughed up from my chest support the cancer diagnosis. At the height of my illness I coughed up many small spicules of bone from my chest. These have been examined recently and the histology of these bone spicules, while not definitive, does clearly support the cancer diagnosis. The report states “the appearance are those (of) modified osteoid fragments and would be in keeping with the clinical history (of osteo-genic cancer), however, due to the obscured nuclear details of the lining cells, the histopathology findings are equivocal”. 6. A review of the numerous X Rays states that they are “typical of cancer” not TB. The initial radiology reports regarding my case clearly confirmed secondary cancer (metastases). This is a direct quote from the first report: “Mottled calcified areas of varying size from 1.5 to 3 cms in diameter are demonstrated overlying the right sacroiliac region, the appearances of which are those of glandular metastases”. However, recently Streeton had all of my available X Rays re-examined with expert radiologists and states “I reviewed these films with my radiology colleagues here at the Mercy Private and the general consensus was that these are typical of an evolving osteogenic sarcoma metastasis”. There was no support for the TB only hypothesis. These six new findings strengthen the four separate pieces of evidence already in the public domain and together provide an overwhelming confirmation of the original diagnosis of secondary cancer later complicated by infection with TB, and clearly refute Haines and Lowenthal’s hypothesis that I only had TB. 7. The clinical picture. Eight independent specialists all confirmed the diagnosis of secondary cancer followed by TB. Eight medical specialists investigated my case with a view to treating me. All examined me and my records thoroughly and ordered whatever diagnostic tests they considered necessary; all of which I complied with. The specialists were Mr John Doyle, surgeon with cancer expertise; Dr Robin Kerr, radiotherapist at Peter MacCallum Cancer Hospital; Dr Ivon Burns, oncologist at St Vincent’s Private; A Gold coast doctor whose name has been lost, but the X Rays he ordered remain; Dr Alastair Robertson, oncologist with TB experience; Dr Rosemary Walker, head of the TB clinic in Adelaide; Dr Jonathon Streeton, chest physician and TB authority; Prof Peter Clarke, chest surgeon with TB expertise and experience. All of these experts investigated my case thoroughly and none suspected my symptoms could be explained by TB alone. All confirmed the initial diagnosis of secondary osteo-genic sarcoma, bone cancer. 8. The visible chest masses looked nothing like TB, acted nothing like TB and were fully consistent with a cancer diagnosis. Streeton comments on these “numerous chest wall masses which appear to be metastatic disease, and certainly quite unlike anything which would be seen in a generalized systemic (and invariably fatal) case of tuberculosis infection”. 9. Chemotherapy did reduce the size of the tumours, as might be expected with cancer and not TB: and also, did not kill me as might be expected if I had TB. The evidence that supports that the chemotherapy did reduce the visible tumour masses has already been reviewed. Of equal significance, it is known that the combination of chemotherapeutic agents I was treated with is highly immune-suppressive. As a consequence, even modest exposure to colds or scratches could result in massive, often fatal infections. If my condition had involved only TB, the chemotherapy could be expected to have at least created these side-effects, but it was more likely, to have killed me. In fact, I suffered few side-effects, the lesions diminished and I have always acknowledged that the chemotherapy I received did play some part in my holistic recovery. No biopsy was performed at the time of the initial diagnosis of secondary cancer for two reasons. Firstly, the clinical picture, the X Rays and other tests so clearly confirmed the cancer, none was deemed necessary. Secondly, a biopsy of the lesions I was initially diagnosed with would have necessitated an unwarranted general anaesthetic and significant surgery in my abdomen or chest. However, in 2004, my left lung was removed subsequent to complications created by the TB. A large piece of bone was evident within this lung. TB can lead to calcification, but not the formation of bone. As Streeton said “one gets calcification from TB, but nothing remotely of the appearances of your calcification”. Further, the histological report on the lung reports extensively on the TB lesions in other sections of the lung. Then, commenting on the histology of the bone removed from my lung, it states “the latter appearance in particular is recognized as a change which may occur in osteosarcoma after chemotherapy”. There is no suggestion this bone could have had anything to do with the TB that was so evident throughout the rest of the lung. Clearly, both conditions existed. Haines and Lowenthal claimed that the TB treatment cured my condition. However, photographs with the dates from Kodak on their reverse establish that all the visible lesions on my chest had fully resolved before the TB treatment commenced in July 1978. How could a treatment cure something that was not there? What I have always maintained - and the evidence confirms - is that I had the 2 conditions - secondary cancer and TB. The cancer was located in various places around my body, most visibly on my sternum (or chest). The TB had infected my chest and initially was not diagnosed given the very obvious presence of the cancer. It was only when the cancer had resolved (which included all the cancer masses on my chest and in my chest disappearing) that the TB became evident within my chest. So back to the duck. Eleven major pieces of evidence are difficult to dismiss. Most reasonable people would conclude eleven was more than enough to differentiate a duck from a dog. So again, while I appreciate it is not an easy thing to do, I respectfully call on Haines and Lowenthal to publicly concede their hypothesis was incorrect and to put the record straight. Consider a letter to the Age. You could write to a letter to the editor: letters@theage.com.au, or directly to the journalist Chris Johnston at cjohnston@fairfaxmedia.com.au. A letter of support to the Foundation: info@gawler.org. Those of us that know the work at the Foundation know how valuable it is and this is a time to support its existence and good work. Ian Gawler Blog: Eating well, Being well – and the new edition of “You Can Conquer Cancer” is released. What a delight to speak at the Gawler Foundation’s conference this last weekend, presenting dietary guidelines and some of the exciting research linking nutritional changes with increased survival. Great chance to catch up with old friends like Petrea King and Dr Craig Hassed and to have the honour of sharing the stage with them. Then there was the opportunity to meet up again with people who came to groups in days gone by. People like the lady who had secondary breast cancer 7 years ago and looks radiantly well. When asked what had helped her most, she thought for a moment, then shared the fact of learning to love herself enough to really care about what she ate, how often she meditated and so on. A real confirmation of Jess' guest blog from last week. Her new husband chimed in with how much he admires her capacity to make those choices and stick by them; how diligent she is. Lots of new people to meet as well and my new edition of “You Can Conquer Cancer” arrived mid morning on the Saturday, hot of the press as they say! That’s synchronicity for you. I had the opportunity to speak on the therapeutic potential of food – a vast topic! A key point. Anyone who might be silly enough these days to say there is no evidence that changing your diet can improve cancer outcomes is just not keeping up with the research. At the conference I shared 17 recent studies that come from the last few years and typify the exciting times we live in as research is making clear the powerful the between what you eat and cancer recovery. For over 30 years my clinical experience has been that food can be used therapeutically in cancer medicine, now we are getting some good confirmation via the research. In the new edition of “You Can Conquer Cancer”, there are several fully rewritten chapters on cancer and food and nutrition, providing the detail of how to put all this into action; how to convert the theory into a meal. The new book is just that, virtually a new book given the rewrite has been so thorough. So for anyone dealing with cancer, for anyone keen on not getting cancer, for anyone interested in a comprehensive, healthy lifestyle, the new book is recommended. As promised here are the research articles linking cancer and nutrition, reproduced via “Out on a Limb”, and the dietary guidelines in summary. Again, the details are in the new book. i) Observational studies suggest a low-fat, high-fibre diet might be protective against cancer recurrence and progression. ii) There is more support for physical activity, with a dose response for better outcomes. i) Healthy weight decreases secondaries by 40 – 50% c.w. being obese. ii) Seven or more alcoholic drinks per week almost doubles the risk of cancer in the opposite breast. iii) Smoking & drinking: increases the risk of cancer in the opposite breast by 7.2 times. Improve the diet, reduce inflammation, assist recovery. 2x increase in colon cancer recurrence and death. But only in the overweight and obese. Cancer’s “camouflage” seems to rely on the protein CD47. Animal trials show anti-bodies to CD47 remove the camouflage, allowing the body’s immune system to recognise and destroy cancer. 3. Consistent multivitamins use before and after diagnosis, eating more fruits and vegetables, as well as being more physically active is associated with better overall survival. 13. TELOMERES are protective, DNA—protein complexes at the end of chromosomes. Telomere shortness is emerging as a powerful indicator of disease risk, progression, and premature mortality in many illnesses, including cancer. Telomere shortening is counteracted by the cellular enzyme telomerase. 14. WHAT INCREASES TELOMERASE ? 2. You Can Conquer Cancer – buy the new edition online (or over the phone) via the Foundation’s bookshop and support the Foundation – NOTE: check to make sure you order the new edition, not the old one! i) Eating Well, Being Well – Outines the Gawler Wellness Diet – the key to good health for everyone. ii) Eating for Recovery – Outlines the Gawler Healing Diet specifically developed for people dealing with cancer. Please Note: This CD builds upon the information on "Eating Well, Being Well”. For those dealing with cancer, you need both CDs for completeness. Food 101 – what fuel goes into your tank? Jess Ainscough is an inspiration. A young and energetic cancer survivor, Jess is super enthusiastic about using her experience to help others. She does this through her great website: The Wellness Warrior, where she writes daily articles on courage, kindness, self-respect — as well as practical how-to’s for shopping, cooking, juicing and nourishing your body. I have done a lot of crazy stuff to heal my body and transform my life. I’ve eaten sea cucumbers, drank straight beetroot juice, injected myself with B12, crude liver and mistletoe, drank castor oil, put coffee up my bottom, put castor oil up my bottom, drank hourly juices, turned vegan, seen energy healers, seen psychics, seen crystal healers, had vitamin C IVs, became a yogi, and taken so many pills and potions that it’s impossible to count. However, there are three things that I’ve done that have had the biggest impact and brought me the most benefits. Healing can be complicated, but when we drill down the principles are actually simple. Self love is the foundation we need to lay down first, so that all of the other elements of a wellness plan stay in place. Without self love, everything crumbles and wellness isn’t sustainable. If we aren’t acting from a place of self love, we are acting from a place of fear or self loathing. Instead of doing things out of love, we do things because we think we should do them. This is impossible to maintain, and it’s not much fun either. I’m all about fun. In the beginning of my journey I was doing things like juicing and meditating because I was afraid of what would happen if I didn’t do them. Everything shifted for me when I started doing these things because I love myself so much that I want to reap the amazing rewards of a super healthy lifestyle. When you garner a deep inner respect for yourself, you actually want to treat yourself with radical kindness. To kick off a love affair with yourself, you can just start by looking at yourself in the mirror and saying “I love you”. Do this for 30 days – get over the weirdness of it – and you will start to experience very subtle, but miraculous shifts in the way you treat yourself. The best change I’ve made to my lifestyle is to eat an organic, plant-based whole food diet. This way of eating has been so life-changing and liberating that I am now in a position where I eat whatever I want, and as much as I want – and I never have to worry about putting on weight or what it’s doing to my health. My body now craves food that nourishes my body and makes me feel amazing. I eat lots of plants, eat only organic, drink heaps of juice, and indulge in smoothies and raw desserts. I don’t put anything in my body that doesn’t belong there. Our bodies are living things, and we need to feed them with live foods. They are designed to consume and digest foods that are grown in the ground – that come from Mother Nature. Not food that is only pretending to be food. This was the hardest one for me to master, but it continues to be the most beneficial. In these crazy busy, overly-stimulated lives we live, it is so important to turn within and seek stillness. I spend 30 minutes each day sitting in silent stillness, focusing on my breath, and training my mind to remain in the present moment. Meditation allows us to tap into our awareness and creates space in our minds. It enables us to let go of our ego and struggles and makes space for healing, creativity, stillness, intuition and connection to our spirit. By training ourselves to hang out in the present moment, we are less likely to get caught up in external drama. Worry and anxiety is experienced far less, and self love grows organically. Jess continues: I would love to know if there’s anything that’s had a profound effect on your personal healing or life transformation? Share away on the comment section below! If you feel you need extra help transforming your life, or there’s someone you love who you think needs extra support, I would love for you to check out an online program I’ve just created called The Wellness Warrior Lifestyle Transformation Guide. It’s a gentle, step-by-step guide that is designed to educate, inspire and make transformation easy and sustainable. 1. Check out this really inspiring YouTube clip – and be prepared to be delighted! I love gardening. I started with my mother before I can remember and continued on with my grandmother after mother died. My grandparents were old school. They had no financial imperative to cultivate a veggie garden; it was just what they did. It came naturally, like common sense and being kind. From early teenage I delighted in providing the muscle, digging over the grandparents back yard, carting compost from under the huge fig tree, rearranging plants and soil and paths according to Granny’s instructions. Tomatoes were always a focal point. However, when I began to run my own veggie garden I found time a real issue. Granny regularly pruned her tomatoes, nicking out the transverse buds and tying the main leaders to stakes. Miss doing this for a few days and it all turns ugly pretty quickly. Here then is the answer. A little preparation, and lots of tomatoes! 1. Buy tomato seedlings in punnets late winter and transplant them into small individual pots. Keep in a glass house or somewhere warm and light. Move outside a few days before planting to acclimatise. If this is not possible, buy your seedlings in a punnet or advanced pots a few days before planting and leave outside to acclimatise. 2. 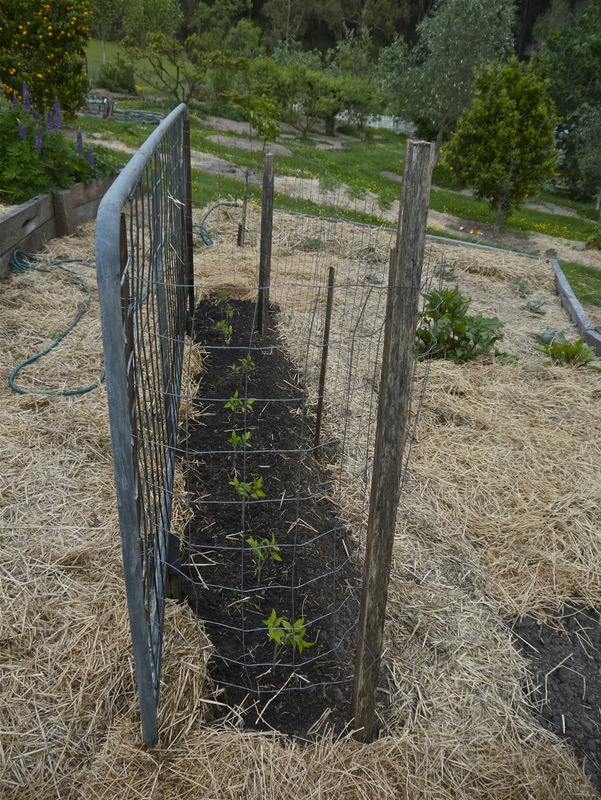 If necessary, prepare the bed for the tomatoes about a month before planting. 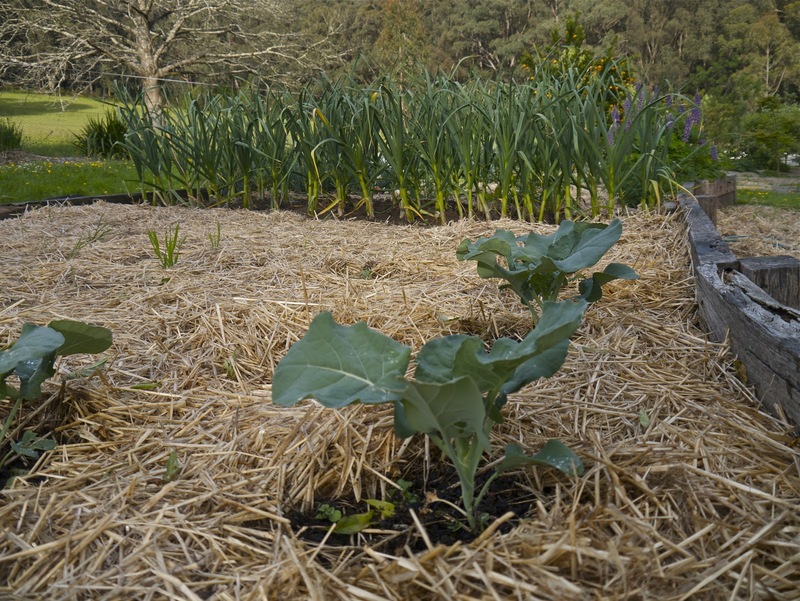 However, I often use the Esther Dean method of planting into compost nestled in the mulch, which takes no preparation – see some broccoli below, about a month after being planted this way(garlic at the back). 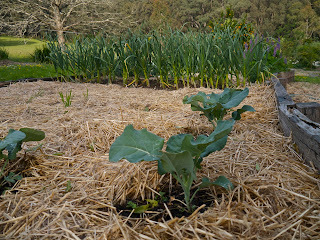 However, this year I dug over the tomato beds, adding compost, some gypsum and lime. 3. Here is the trick. 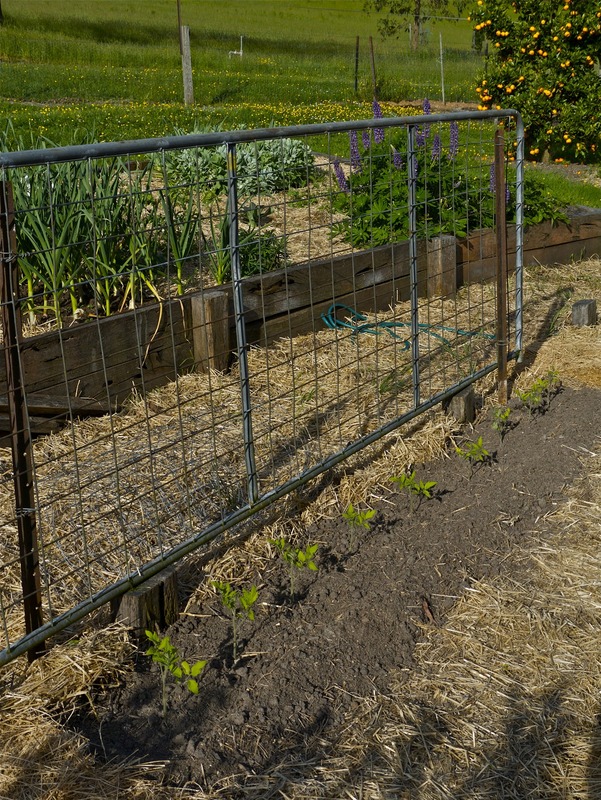 Use two sections of wire to contain the tomatoes as they grow - and do away with the need to prune or tie them. On one side I use an old gate – courtesy of the farm we live on – as shown. On the other side I use wire netting with big holes (sheep netting). 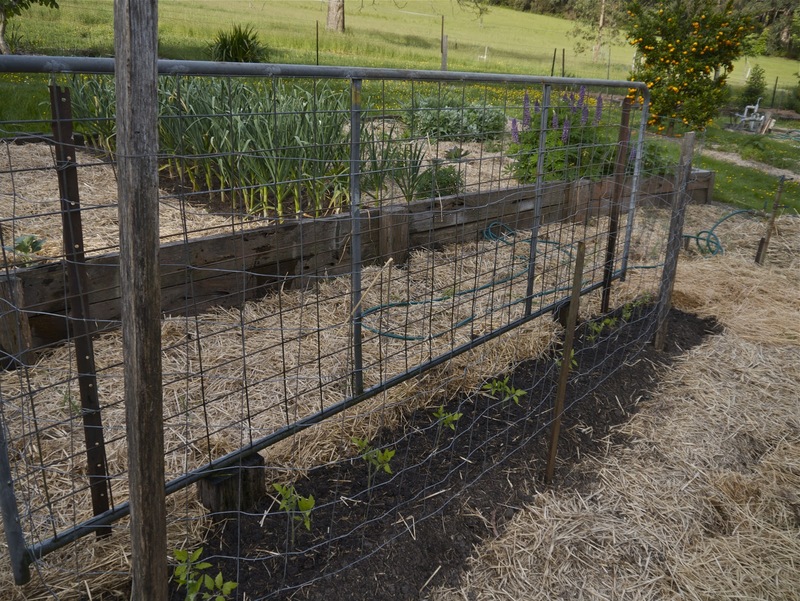 However, you could easily just use two sections of netting supported by suitable stakes driven into the ground. 4. 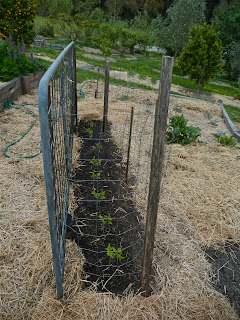 Then simply plant the tomatoes between the fencing as shown, water as needed. As the plants grow, they branch out, and are supported by the fencing and each other. All you need to do now is wait for ripening, and do the picking by putting your hand through the wire mesh. Later in the season I will show you what happens here. 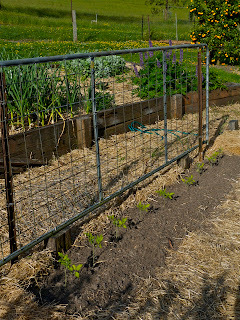 I use the same technique for dahlias, a wire fence on one side (for dahlias you could use a solid fence), and the open sheep wire mesh on the other side. Anyone got any other good tricks? Share via the comments section. Enjoy those tomatoes. Back a winner. Nothing like the home grown stuff! DON’T MISS OUT… STILL TICKETS LEFT! There are only 2 weeks before the Gawler Foundation's conference Profound Healing - Sustainable Wellbeing. This year the Foundation has collaborated with The Sebel Albert Park and Organic Wholefoods to bring you an Organic Vegetarian Feast including morning tea, afternoon tea and lunch. Whether you are living with chronic illness, are interested in general health and wellbeing, or you are a health professional, there is something for you and your future health and wellbeing. * Having trouble sleeping? * Has your sexual wellbeing been affected by chronic illness? * Living with chronic pain? * Need some guidance regarding nutrition? * Affected by depression? * Interested in the latest treatment advances? * Struggling with motivation? * Confused about natural & complementary therapies? Be educated, inspired and empowered by 21 impressive speakers. Take away practical tools and techniques to improve your health and the health of others. Speakers include Petrea King, Lauren Burns, Dr Craig Hassed, Prof Avni Sali, Nicole Bijlsma, myself and many more. BOOK NOW online and explore new pathways to health and wellbeing. See you at the conference. Feel free to forward these details to friends, family and colleagues you think might be interested in this event.